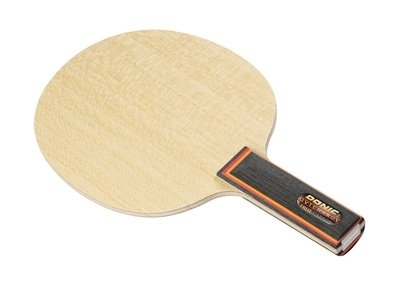 **Topspin recommended** The blade chosen by Dima Ovtcharov presents the perfect combination of speed and feel. As a consequence of the change to plastic balls, the European Champion looked for a solution that would meet his high requirements. A blade to compliment Dima's powerful strokes whilst enabling him to play the short service and return game with precision and accuracy. The combination of five high quality plies and two layers of carbon has resulted in a top class blade.